It is said that "all politics is local." I believe that this is a truism. While we must be concerned about things that happen in Washington, Geneva, New York, and Brussels, as well as Helsinki, Moscow, and Beijing, politics begins at home. Sometimes we forget about our local elections, whether school board, city council, or state representatives (to name a few), thinking that they are less important than Presidential elections. While I believe that Presidential elections are vitally important, issues of education, jobs, transportation, even the environment require local input. So, without diminishing statewide and national elections, it's important that we pay attention to these local elections, including primary elections. 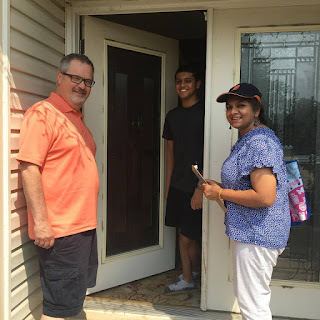 So, speaking of local elections, my good friend Padma Kuppa, is running as a Democrat to represent the 41st District (Troy and Clawson) in the Michigan House of Representatives. I know Padma well, having been engaged in interfaith work with her for the past decade, decided to run for a seat in the Michigan House of Representatives. For what its worth, I want to use this post to endorse Padma for the position of State Representative from the 41st District in Michigan. Since I'm a pastor I have to be careful about making endorsements, but I can and do make them as a private citizen. So I am endorsing Padma's candidacy on this blog, which represents my opinions and not those of the church I serve (in case anyone wonders). I believe that she is both well prepared to serve, and is the best qualified person for this important position. I am finding this election season intriguing. Its been awhile since I've been really active in a campaign (I was much more involved as a young teen than I have as an adult). In support of Padma's campaign, I have been walking neighborhoods with her, knocking on doors, and talking with residents. Things are a bit different today than in 1972, when I went door to door for a certain presidential candidate. Today, canvassers are provided with an app that lists houses of persons who are thought to be open to supporting a candidate from the Democratic party. We've been talking with folks, some of whom are not paying attention to things political. One person on this past Saturday named divisiveness as his biggest concern. Others spoke of education and the environment. We had a lengthy conversation with a recent high school graduate, who was probably as informed a voter as we've encountered. She was concerned about water quality and women's rights (she had participated in the women's march in Lansing). That made me feel good, to hear someone so young, so engaged in the issues of the day. We need more like her---at every age. Voting for a member of the Michigan House might not resolve tensions in Iran, North Korea, or Russia, but politics starts local, with races for City Council and the House of Representatives. I am not enamored with candidates for positions like governor, senator, or president, who don't begin locally. They may think they have answers to big questions, but they probably haven't gone door to door in neighborhoods, asking people what is on their minds. That's what Padma has been doing --- I know because I've been walking with her. I know what issues are on her heart, and education is at the top of the list. So, Padma has my vote, and if you're in the 41st district of Michigan, I hope you will giver her your vote as well. Now, she is running unopposed for the Democratic nomination, so she'll be on the ballot in November, but even still come out and vote on August 7. There are other important races on the ballot. If you're not living in the 41st, still pay attention to those local races. They are important!! Remember All Politics is Local!